Mary Augusta Brazelton, University Lecturer in Global Studies of Science, Technology and Medicine at Cambridge University, explains how one of the first scandals involving ‘Communist brainwashing’ also serves as an entry point for understanding how the Chinese Communist Party used public health and biomedical expertise to consolidate its political power at home. A Chinese-Korean propaganda film produced in 1952 provides a particularly rich perspective on these allegations. 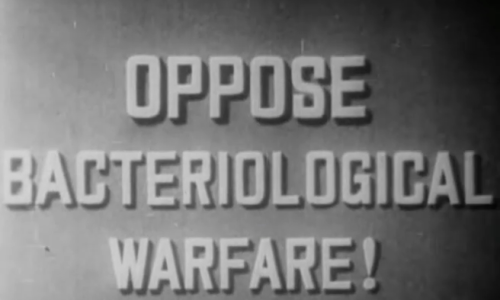 The movie, “Oppose Bacteriological Warfare,” features the American pilots’ confessions, yet also suggests important connections between hygienic practices and the state in modern China. Just one of many propaganda pieces that appeared in China between 1950 and 1952, the film was co-produced by the Peking Film Studio and National Film Studio of Korea. (Versions exist in English, Spanish, and other Western languages, as well as Chinese.) The main figures who appear in the film are Chinese biologists, health workers, and witnesses called to testify to the manifestation of biowarfare. The film shows the significance of biomedicine in reinforcing state authority and indicates the role that the accusations played in establishing an important administrative mechanism of public health, the Patriotic Hygiene Campaigns. Much scholarly attention has been given to a panel of European and American scientists who supported the allegations. Among them is the Cambridge biochemist and China scholar Joseph Needham. But less attention has been paid to the Chinese biomedical researchers interviewed by the panelists, many of whom had spent years themselves studying in Europe and North America and were friends and former colleagues of the panelists. For instance, for Needham, the 1952 excursion was a chance to see scholars like the Harvard-trained Tang Feifan, whom he had first met in southwest China during the Second Sino-Japanese War. My recent research seeks to recover the experiences of scientists like Tang, and with them a better understanding of the history of biomedicine in twentieth-century China. 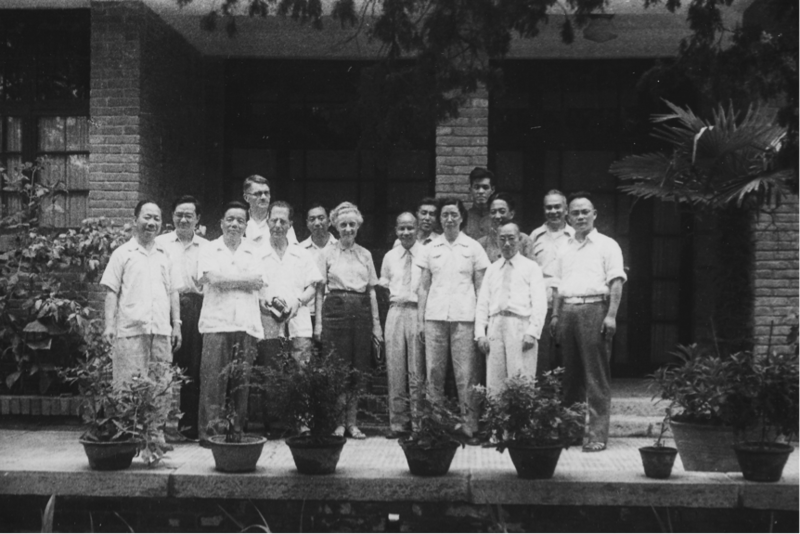 Joseph and Dorothy Needham with Tang Feifan and staffers, National Epidemic Prevention Bureau, Beijing, 1952. Considering the Chinese experts featured in the film reminds us of how the accusations of biowarfare brought Chinese medical science to the forefront of the Korean conflict at a time when many intellectuals were undergoing political purges. Supporting the Communist Party may have required some Chinese researchers to make difficult choices. That these scientists published pieces supporting the claims of American germ warfare and joined military medical teams at the Korean front of the “War to Aid Korea and Resist America,” as it was known in China, suggested a repudiation of their pre-1949 connections to the West. The Chinese Communist Party relied on the scientific expertise of leading Chinese researchers to lend credence to the allegations, but, as the film shows, it also claimed that the new People’s Republic of China had its own scientific authority—a phenomenon that Miriam Gross and Sigrid Schmalzer have discussed in other contexts. The film began with wide shots of health workers gathering specimens that were deemed unnatural to the environment. (Historian Ruth Rogaski suggests that the germ warfare allegations emphasized a theme of environmental disaster that was constantly present in modern Chinese history.) These samples were then sent to laboratories and prepared for bacteriological analysis, where the same researchers who had published articles supporting the allegations used microscopes to confirm the presence of pathogenic organisms in the samples. Here, the narrator presented Xie Shaowen, head of immunology and bacteriology at Peking Union Medical College, who, the film claimed, confirmed the presence of anthrax bacilli in spiders found in northeast China. Researchers like Xie not only endorsed the accusations, but also found themselves playing roles in mass campaigns to address the dangers of biowarfare that they had identified. The film shows how the People’s Republic of China responded to the new threat of bacteriological weapons: by establishing a nationwide public health movement called the Patriotic Hygiene Campaign. As part of the campaign, volunteers staffed epidemic prevention teams along the Korean front, and China’s national government sponsored a variety of hygienic practices in every province that included mass immunization (the focus of my own research), street-sweeping, latrine building, and disease vector eradication. As historians Rogaski and Albert Cowdrey have demonstrated, regardless of the veracity of the allegations, the Chinese state acted as though they were true. In the years after 1952, then, the same Chinese researchers who had endorsed the accusations of germ warfare led university departments and research institutes that oversaw the development and mass production of vaccines and other bacteriological products in service of the Patriotic Hygiene Campaigns. The Campaigns have endured to the present day, although memories of bacteriological warfare have faded. So, too, have public memories of researchers like Xie Shaowen or Tang Feifan, who stood at a unique point in the history of the life sciences in China: facing pressures to apply their scientific expertise to particular political ends, but also finding leadership roles to use that expertise to promote public health on a national scale. 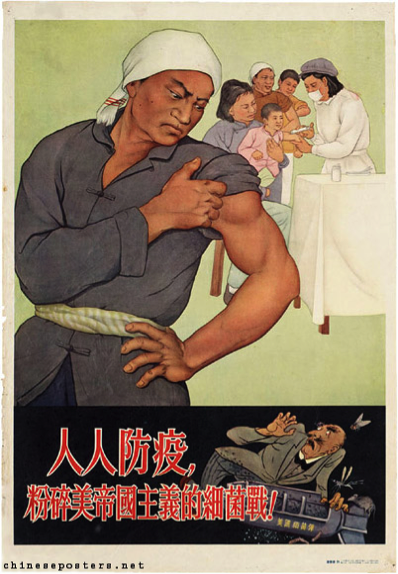 A muscular young man, perhaps representing the strength of the Chinese military, rolls up his sleeve for a vaccination and glares menacingly at an “American imperialist,” who clutches a bomb and is surrounded by insects. In the background, a nurse vaccinates children, women, and other civilians. Wu Zhili 吴之理, Yi ming jun yi de zishu 一名军医的自述 (A famous military doctor’s account in his own words) (Beijing: Huaxia chubanshe, 2004) 40-41.